We know we’re not saying anything earth-shattering when we say that first impressions count. 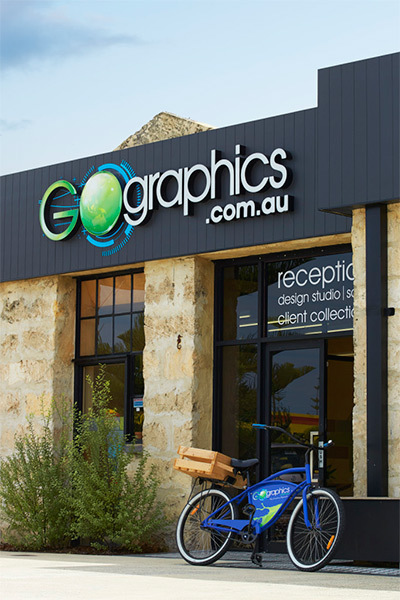 At Go Graphics, we help our clients create a rockin’ first impression long before their customers even know they’re looking for them. Collaborating with you, we’ll design eye-catching signage that creates the right visual tone for your company and distinguishes you from the crowd. We’ll help you spread your brand image far and wide by creating signage that you can put on your car, boat, banners, or front and centre at your premises. Our team has a broad cross-section of industry experience and we’ve been entrusted with some of WA’s most iconic brands – like City Farmers, Acton Real Estate, Rottnest Express, and Scott Park Group. By letting us Ace their image, our customers are going places, receiving the right kind of attention and growing their brands.